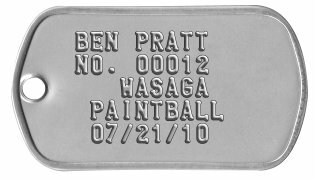 See more details about our Paintball Warrior Dog Tags or Customize yours now! 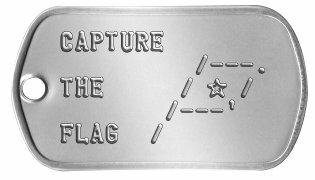 See more details about our Milsim Team Dog Tags or Customize yours now! When suffering from an asthma attack you might not be able to speak, let your dogtags do the talking. 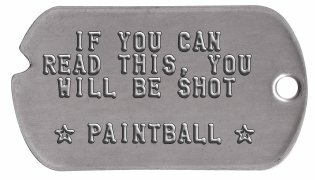 See more details about our Paintball Commando Dog Tags or Customize yours now! Run a paintball field? 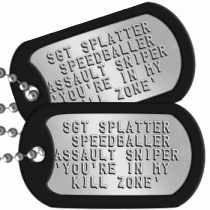 Why not issue dogtags to your members? We offer volume discounts and can accommodate tag serialization. 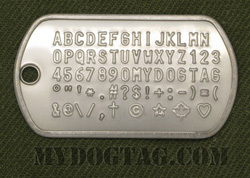 See more details about our Field Membership Dog Tags or Customize yours now! Many paintball and Airsoft fields host events, scenarios, and competitions recreating famous battles or capture the flag. 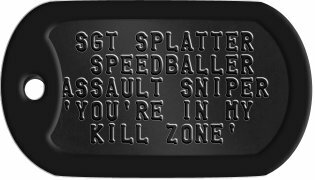 See more details about our Airsoft Scenario Dog Tags or Customize yours now! All orders are shipped within 1 business day and are usually delivered within 1 week (in North America). 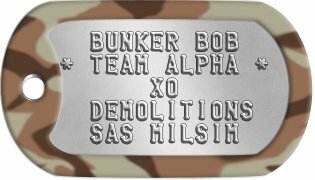 If you need any assistance creating or ordering your MilSim Dog Tags please contact us directly, we are here to help!